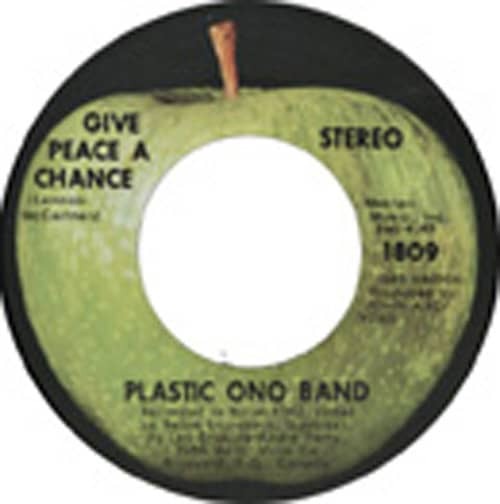 Despite label credit to The Plastic Ono Band, Give Peace A Chance is unmistakably the work of John Lennon. The song's genesis is well-known: it was written while John and his new wife, Yoko Ono, were on their honeymoon in Montreal and recorded in a hotel room with Tommy Smothers among others playing guitar. When released in the U.S. in July, 1969 its oft-repeated chorus, "all we are saying is give peace a chance," quickly caught the ear of anti-war demonstrators. By the time Pete Seeger led a sing along at the October 15, 1969 Moratorium Day gathering in Washington, D.C. it had become the anthemic chant of the war. John Lennon was born on October 9, 1940 near Liverpool, England. He and Paul McCartney formed The Quarrymen who morphed into Johnny & The Moondogs, then the Silver Beatles and finally The Beatles, the most famous and best-selling rock group of all time. As a member of The Beatles, Lennon was part of 20 #1 singles, 15 #1 albums and 21 songs that rank among the 'Rolling Stone' 500 Greatest Songs of All Time. On his own he had two more #1 singles and three #1 albums. When Give Peace A Chance was released the Beatles were still intact. After the breakup in 1970, the three other Beatles would also establish solo careers that garnered them #1 records, and in the cases of Paul McCartney and George Harrison, individual enshrinement in the Rock and Roll Hall of Fame. As a group, The Beatles were inducted in 1988. With updated lyrics by Lennon's son, Sean, Give Peace A Chance was revived in 1991 on the eve of the Persian Gulf War. Among the new issues addressed by an all-star lineup, collectively called The Peace Choir, were 'gay spouse,' 'green house,' 'H.I.V.' and 'toxic waste dumps in the sea.' The original song, with its roll call of 'isms' and references to revolution and evolution, is in the Rock and Roll Hall of Fame along with its co-writer. Lennon was elected in '94, fourteen years after he was shot to death outside his New York City apartment. Customer evaluation for "Give Peace A Chance - Remember Love 7inch, 45rpm, CS"